I expected we would not see new photos of Kate until her next engagement on June 13th, where she and William will accompany the Queen on a visit to Nottingham. However Kate sightings are like buses you wait quite a while for one and then several come along at once :) The latest issue of In Touch magazine features a photo of Kate shopping in Chelsea on June 2nd. Incidentally the same day as the Epsom Derby. The couple missed the first day of the Jubilee celebrations because Prince William was undertaking flying exams for his captaincy, which he is expected to achieve in the very near future. Kate looked chic in a dark green dress with a ruffled hem teamed with a matching belt and waterfall cardigan. (I will update with ID's if they are confirmed) The Duchess wore her hair scraped back in a bun and accessorised with a white handbag with black stripes and pearl earrings. As for the headline the article is running, I do not believe Kate is pregnant. The only source who can provide official confirmation is Clarence House and they have not done so. The pregnancy rumours have persisted since the wedding and will no doubt continue to do so. This magazine has run several stories over the past year 'confirming Kate's pregnancy' and discussing the couple's alleged 'baby heartbreak'. 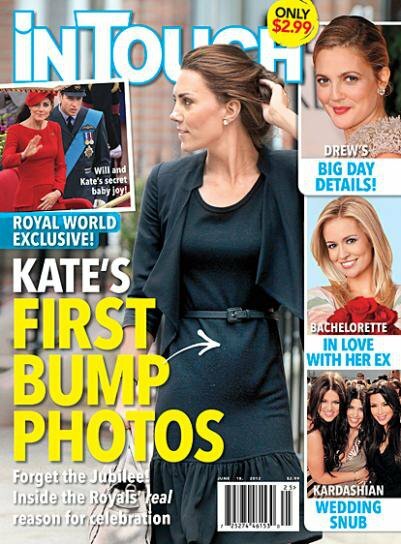 The issue of In Touch featuring Kate on the cover is available tomorrow for $2.99. The juxtaposition of the two magazine covers are hilarious. I would be seriously surprised if there was a baby announcement before their Asia trip. Who wants to be dealing with morning sickness during the Jubilee, the Olympics, and the punishing trip schedule? Exactly! I'd be amazed if there's any announcement before mid-2013 and exactly for the reasons you cited, Claire. They're both young, they've got plenty of time and they DO realize that they have a duty to their positions and the Queen and the family, which is to undertake these obligations. Exactly Claire, It's always lovely to see new pictures of Kate but there is no reason to believe Kate is pregnant. I feel so sorry for the Prince & his Duchess. I can't believe these magazines write these lies about them. I am sure once they are expecting we will hear it from the Palace. Let these two alone so they can enjoy their life. There was no bump in the dress she wore yesterday! 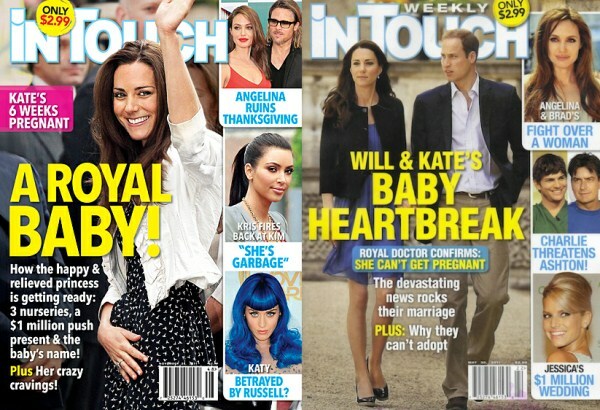 That's ironic- the same magazine that says they cant have a baby is now claiming that Kate is pregnant. Thabks for the new post: i didn't know there was pics of kate while she was shopping: what a surprise. No idea about the outfit and of course I dont believe about the pregnancy rumors. Howevere I love to see she is "human": she's got a belly a little bit bigger than usual like all other girls:-DD..I love her! And I love your blog: it's inspiring and you do a great job! and no reason not to. William back on booze , Kate not , Kate leaves party early , comments are "looks more secure , more at home with royals" , Pippa off to USA (not needed anymore), just them on balcony ( next generation) I am not saying either way but I am sure they wanted baby to be expected in first year and would not mess with nature now so why not? Plans can be redone for tour or cancelled. Better than having to go get assistance. That's why I don't bother reading those trashy tabloids! Your blog carries the best news and pictures. Thank you for taking the time to do it, Charlotte! it's funny this article came out today, my mom and I were talking about Kate at Lunch today (before either of us saw this) and she was mentioning she thinks Kate is pregnant. So I am going to say yes. I did notice that too. Hardly a smile from him although he rarely smiles in public. Nearly every picture he was scowling or looking disinterested. He's not a "people" person and doesn't seem to connect well with his subjects, as his grandmother does, as his mom did and as his wife and brother do. William had been busy studying for his captain test and had the test over the weekend (on Saturday). Then his granfather was taken to the hospital. They all had a very busy weekend and worried about Prince Phillip. I have seen pictures of William smiling. No way! William totally connects with people. He definitely gets that from his mother. As for him looking broody or disinterested, I really really doubt it. TONS of pictures are taken of him during every engagement and he's not going to be beaming in each one. At the very least, if you watch videos you can definitely see he enjoys these kinds of celebrations. If anything, he looks like he's having a good time more often than his grandmother does! Even more, if you had hundreds of cameras snapping in your face, would you always look thrilled? Also, can I mention that photos of Kate, in various outfits and at different appearances, holding her hand in front of her stomach, has appeared for months? It's a habit, something she does, probably quite unintentionally. And every single time - for nearly the length of months it takes for a baby - it's been interpreted to mean the Duchess is expecting. I'll believe it when I read the announcement from Clarence House. Kate may or may not be pregnant but I don't think there's any baby bulge if she is. Photos of that close-fitting lace dress show her flat and fabulous figure. On "What Kate Wore", there's a photo of her clutch that shows her tummy and there's no bulge. That red McQueen with the peplum and pleats would also be unflattering if her tummy was sticking out as much as that cover photo implies. (The pleats wouldn't hang straight.) Ditto that tight dress Kate wore to the concert. Oh gosh, she's not preggo! !I wish the media would stop hounding her like that!! As much as I'd love these "news" to be true, I regard them as completely made up rumours that the tabloids are making in order to sell their magazine. I wouldn't put it beyond them to photoshop the picture in order to create the illusion of a bump. In fact I am sure they did, because we saw how flat Kate's belly was the day before yesterday. Putting those 3 magazine covers together just proves how idiotic the tabloids are. Such headlines that magazines print makes you want to hold your head in your hands that such things are allowed to go to print. I really don't see them even trying until next year or later this fall for a baby. And seriously...we just saw her for the Jubilee weekend looking radiant and super skinny in all her dresses, these mags are such trash! trash! just red somethin that said that' they wre shooting to announce a pregnancy in three months. feel bad for them! tryin to have a baby and the press keeps butting in! I think we will hear something come Christmas. William said in his interview with MS. Couric that he & hsi beautiful Duchess want children soon. So I feel that once they are back from their trips this fall we will hear that she is in a motherly way. The baby will be born in mid 2013. Just my 2 cents. They will make great parents and their babies will be beautiful just like the parents. Is there any way of knowing if it's an authentic recent pic -- a magazine like that could surely have raked something up from a couple of years ago. William said in the interview he and Kate like to keep things to themselves before announcing to the public. Knowing those two she will be pregnant for a while before we all know and that is great let them enjoy some nobody else knows time before the whole world chimes in their opinions. As always the Duchess and her Prince looked great. Maybe William was worried about his test and his grandfather this past weekend. It was a lot to take in. it's a bit hard to tell if those are actually correct ID's, but they do look similar...what do you think? Oh thank you so much for remembering Lauren. Oasis actually denied the dress was theirs as far as I know but the bag looks spot on. Your very thoughtful! The Oasis looks identical, I'm wondering if the photo made the colour look a little green and Oasis never stocked green when it could have been navy. Great spot though, thank you Lauren.